The smaller size of nutritionally-at-risk populations has been considered an advantage when resources are limited, since energy expenditure for the maintenance of a small body would be less than for a larger one, and the energy cost of movement would also be less. The manual transportation of loads in developing countries persists as a major occupation of the adult work force (United Nations Demographic Year Book (1979, 1980), and while there have been a number of studies on the energy cost of load-carrying (DATTA, CHATTERJEE and ROY, 1973; GIVONI and GOLDMAN, 1971), there seem to be none which compare this activity in nutritionally normal and malnourished subjects. Because the relationship between body size and energy expenditure in carrying out work tasks is not completely understood, we have recently done some experiments on load-carrying in nutritionally normal and malnourished boys and well-nourished men (SPURR and REINA, 1986). The latter were included to give a wider range of body weights as well as a different environmental background. Three age-groups of boys (6-8, 10-12 and 14-16 years of age) were studied while walking on a treadmill (3 mph) at 0, 4, 8 and 12% grade without and with a 3-, 6- or 9-kg backpack load in the youngest to oldest age groups respectively. The adults also carried a 9-kg load. The results are summarized in Figure 8 where the energy expended at each workload (grade) is expressed as a function of the body weight (without load) or body weight plus load. Two conclusions are immediately evident from these results. First, the energy expended in treadmill-walking without and with loads is a function of the body weight and the weight carried and not of nutritional status, since the two nutritional groups fall in the same line. Furthermore, age per se does not seem to influence the relationship except as it influences body size (weight). Similar results were also obtained by MAHADEVA, PASSMORE and WOOLF (1953) for nutritionally normal subjects. They concluded that no significant increase in precision was obtained by also taking into account height or age. The linear regression values for walking at 0% grade in our experiments (Figure 8) are very similar to those obtained by these authors. Secondly, the energy cost of carrying a given load (i.e., in excess of that required to move the body weight) is the same regardless of nutritional status or body size since the slope and intercepts are constant and, at a given body weight, only the change in weight carried will increase energy expenditure. A third conclusion can be derived indirectly from the results in Figure 8; since VO2 max (Figure 7D) is less in the smaller (younger and malnourished) subjects, the O2 cost of carrying a given load will be relatively higher (% VO2 max) in these subjects than in larger ones. This is borne out by direct calculations (SPURR and REINA, 1986). Finally, the divergence of subjects (normal and malnourished Colombian boys and North American adults) gives the expectation that the relationships seen in Figure 8 may apply to other groups (ethnic, sexual, etc.) as well (SPURR and REINA, 1986; DATTA, CHATTERJEE and ROY, 1973). Figure 8. Mean energy expenditure as a function of treadmill grade, body weight, and body weight plus weight of load carried in nutritionally undernourished boys walking at 3 mph. Boys 6-8, 10-12 and 14-16 years carried 3, 6 and 9 kg respectively, and adults also 9 kg (SPURR and REINA, 1 986). This equation was derived from measurements in adult subjects, using much heavier loads than those employed in the studies described in Figure 8 and allows for the fact that, at heavier loads and faster walking speeds, the relationship between the weight moved and energy expended is no longer linear (GIVONI and GOLDMAN, 1971). In considering the application of this equation to a work situation, several factors must be considered. In addition to the weight of the subject, his/her VO2 max. age, speed of walking and, perhaps, work efficiency, the weight of the load and the distance carried, total duration of the work and rest periods must also be taken into account. Figure 9 presents the results obtained when the Givoni-Goldman equation is used to estimate the energy expenditure and then the average % VO2 max during an 8-hour workday for three adult males with differing body weights and VO2 max values who are carrying a 20 or 30 kg load for from 100 to 0% of the time while walking at 4.8 km/h (3 mph). The four panels show the results for 0-, 5-, 10- and 15-minute rest periods each hour in relation to a theoretical 40% VO2 max sustainable for an 8-hour workday. The energy expenditure during rest periods is estimated as 1.4 times the basal metabolic rate (FAO/WHO/UNU Expert Consultation, 1985) with the latter calculated for men 18-30 years of age using the Schofield equations (SCHOFIELD, 1985). Two subjects with body weights of 70 and 50 kg but the same VO2 max (45 mL/kg/min) of healthy men in good physical condition are shown. The larger man is at about the 40% limit only while carrying the 30-kg weight 100% of the time and shows some reserve for the other conditions of work. The smaller man with the same VO2 also is capable of considerable work effort, although the proportionately heavier (30 kg) load results in more time spent above the 40% limit and at all durations of load-carrying and rest periods allows for less reserve effort than in the larger subjects. Figure 9. Estimated mean % VO2 max during 8 hours of work as a function of the % time a 20- or 30-kg load is carried by three men of varying body weight and VO2 max while walking on a treadmill at 4.8 km/h. The equation of GIVONI and GOLDMAN (1971) was used to estimate energy expenditure. The four panels show results for rest periods of 0, 5, 10 and 15 min/h of work and the figures across the bottom the number of round trips each subject could make per hour covering a distance of 100 m.
A third subject weighing 50 kg and with a low VO2 max. either because he is sedentary or malnourished (Figure 9), is also shown. In this case, most of the relative effort is above the 40% limit until the condition of 15-minute rest periods per hour is reached. If these estimates are applied to a load-carrying task involving transport of the load over a distance of 100 m followed by a return to pick up the next load, then the number of trips per hour is shown across the bottom of Figure 9, and the relative effort expended will be for 50% walking alone and 50% carrying of the load. If, indeed, the two men with the higher VO2 max values are able to work continuously without the hourly rest periods while transporting the 30-kg load, they will be able to make more trips and thereby "produce" more than the subject with the lower VO2 max. Furthermore, if the work performed is piece-work, then, because they have a reserve capability, they may also be able to increase their speed of walking and thereby increase their earnings, whereas their disadvantaged co-worker does not have this reserve available. These kinds of calculations of the limits of daily work are not new (MULLER, 1953; PASSMORE and DURNIN, 1955), except insofar as they attempt to relate work limits to a % VO2 max and to include a subject with reduced working capacity. The conditions described in Figure 9 are concerned with work days of 8 hours, and are probably limited to 5 days per week, and concepts of "productivity" as they occur in western societies. What about the individual with marginal nutritional status who has to get the same work done in order to survive, but is not constrained by the 5 o'clock whistle which calls an end to his workday? By working at a rate which allows for 15-minute rest periods per hour he can transport the same number of 30-kg loads as his more advantaged counterparts in 10 hours and 40 minutes. Figure 10 shows some calculations of total energy expenditure during the three principal divisions of the day: work, rest and sleep, using the same assumptions as those employed in Figure 9 for transporting the 30-kg load. The rest period between work and sleep is predicated on 1.4 x the basal metabolic rate to make the estimates similar in the three subjects. It is clear that of the two men with high VO2 max values, the smaller is able to complete the same tasks as the larger while expending and, therefore, requiring less energy. In both, the fraction of the total energy needed for work is approximately the same (63-64%). On the other hand, the small individual with reduced work capacity, because he has to work longer, expends more energy than his similar-sized counterpart and uses 70% of his total requirements for the work task. Also, he has less time for discretionary activities. Furthermore, working at 39% of his VO2 max for over 10 hours may not be possible (MICHAEL, HUTTON and HORVATH, 1961; ÅSTRAND, 1967). These kinds of calculations underlie assertions that the smaller size of nutritionally disadvantaged populations is to their benefit. And, certainly, where they are able to maintain respectable working capacities, the smaller individual would appear to be a more efficient machine in relation to his/her utilization of energy in the performance of work, albeit with a slightly smaller reserve for additional work. On the other hand, the small man with reduced working capacity would appear to be inefficient in energy usage in situations where he has to compete, with the same work output as the others, in the sense that he has less time for discretionary activities and uses more of his energy requirements for the work task (Figure 10). The calculations in Figures 9 and 10 were made assuming no difference between subjects in work efficiency (see below). The calculations in Figure 9 might also support the contention that smaller individuals become disadvantaged in hard work only, when VO2 max per kg body weight is also reduced (FERRO-LUZZI, 1985; WATERLOW, 1986). However, even in the case of the 50-kg man with a VO2 max of 45 mL/kg/min, it is clear that his reserve for further increase in effort is reduced. The computer modeling which produces the data for Figures 9 and 10 is based on an equation derived from measurements on subjects never exposed to chronic energy deficiency and, therefore, to the possible adaptations which might occur in malnutrition. These data should be obtained before and after nutritional intervention in subjects who are initially malnourished. MICHAEL et al. 's (1961) estimate of the maximum % VO2 max sustainable for 8 hours of treadmill work in the laboratory was 35%, as was our own in sugar-cane cutters in the field (SPURR, BARAC-NIETO and MAKSUD, 1975). However, of the 54 cutters studded, 16 sustained estimated efforts greater than 40%, one as high as 56%, during 8 hours of work (SPURR, BARAC-NIETO and MAKSUD, 1977). While ÅSTRAND'S (1967) estimate was about 40% of VO2 max. JORGENSEN (1985) has also suggested that individual tasks must be adjusted to metabolic levels not to exceed 30-35% VO2 max. There has been some implication in the literature that smaller, perhaps malnourished individuals may perform their daily work-tasks more efficiently than others as an adaptation to chronic energy deficiency. In considering this topic, WATERLOW (1986) has divided efficiency into mechanical and physiological efficiency and efficiency in "real life". Mechanical efficiency is the ratio between the work done and the energy expended in doing it. It can be further subdivided according to the baselines used into gross, net, work or delta efficiency (GAESSER and BROOKS, 1975), with the latter probably more nearly representing muscular efficiency, although this has been called into question (STAINSBY et al., 1980). Certainly the ratio of work done to the energy cost of doing it can be considered in terms of the "economy" of work, whatever the baselines used, as long as one is not too impressed with the data as true measures of muscular efficiency. Because of the difficulty sometimes encountered in measuring the work done, the term economy (defined as the submax VO2 per unit of body weight required to perform a given task) has become widely accepted as the physiological criterion for efficiency of performance (CAVANAGH and KRAM, 1985) and probably coincides with Waterlow's "real life" efficiency (WATERLOW, 1986). Figure 10. Estimated energy expenditure in work, rest and sleep of the three men in Figure 9, during a workday in which a 30-kg load was carried so that all three transported 192 (24 × 8) loads. The % values within the bars at the far right are the % of Work/Total. Figure 11 shows some calculations of mechanical efficiency made from data gleaned from three sources in the literature and our own data on the nutritionally normal and malnourished men described above. These data were obtained by different methods under varying circumstances and are not meant to be compared between investigators, but rather with the controls within each group. ASHWORTH (1968) performed a step-test on 10 Jamaican subjects on unusually low calorie intakes and on 10 control subjects. There was a significantly higher gross efficiency (1 %) in the low-intake group. 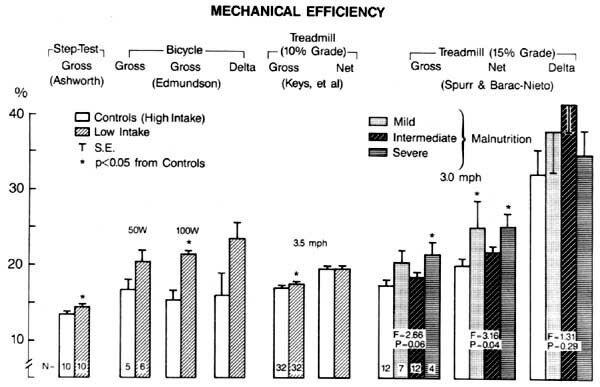 The next set was obtained from the study by EDMUNDSON (1980) using a bicycle ergometer and shows that at 100 W the gross efficiency of the low-intake subjects was significantly higher than that of the high-intake men. NORGAN (1983) also calculated the net mechanical efficiency from these data and pointed out that the high-energy intake group had lower values than would be expected, and that the significant difference at 100 W appeared to rise from low values in the control subjects. The values obtained for delta efficiency are also much lower than those reported for normal subjects (GAESSER and BROOKS, 1975) and, while the difference was not statistically significant, raise questions about the importance of these findings. The data from the Minnesota study of KEYS et al. (1950) were used to calculate gross and net efficiencies (using BMR as the baseline) from treadmill data before and after a 24-week period of semistarvation. The paired sample statistical comparison was sensitive enough to pick up a statistically significant difference in gross efficiency of 0.5%, but there was no significant difference in net efficiency following semistarvation. Finally, our data in Figure 11 does not show the kind of consistency that would give confidence that malnutrition results in increased mechanical efficiency (SPURR and BARAC-NIETO, 1984). The data in Figure 11 were all calculated retrospectively from experiments not designed to answer the question: "Does chronic malnutrition result in increased mechanical efficiency?" Prospective studies should be carried out to specifically answer this question, particularly in relation to the speed with which work is done, as suggested by WATERLOW (1986). Figure 11. The mechanical efficiencies calculated from data by ASH-WORTH (1968), EDMUNDSON (1980), KEYS et al., (1950) and SPURR and BARAC-NIETO (1984). We have also reported on the efficiency of submaximal treadmill walking in the normal and marginally malnourished school-aged children described above (SPURR et al., 1984). When delta efficiencies were calculated, there were no significant differences with age nor between nutritional groups. The lack of age effects in delta efficiency has been confirmed by COOPER et al. (1984). Consequently, marginal malnutrition in school-aged Colombian boys does not appear to have any effect on the delta efficiency of muscular work. The submaximal VO2 (L/min) of treadmill-walking at 3.5 mph and 15% grade increased with age (body size) and was lower in malnourished boys than in their nutritionally-normal counterparts as shown in Figure 12. However, when expressed in terms of O2 cost per kg of body weight the opposite was true, i.e., higher VO2 /kg body weight in younger (smaller) than older (bigger) subjects and in undernourished (smaller) than control (larger) boys. The observation that the O2 cost (L/min) of treadmill-walking or bicycle ergometry increases with age in children and decreases with age when expressed in terms of body weight (mL/kg/min) is an old one (ROBINSON, 1938; ÅSTRAND, 1952) which has been repeatedly confirmed (DANIELS et al., 1978; PATE, 1981; MONTOYE, 1982). The increase in VO2 (L/min) with age is an expected result since VO2 is related to body mass, and older and heavier boys are performing more work at the same treadmill speed and grade. This effect of body weight would also seem to be a reasonable explanation for the fact that the smaller, undernourished children follow a similar pattern with age but at lower VO2's than their nutritionally normal counterparts. It has been implied that the fall in submaximal VO2, expressed in terms of body weight, with age represents an improved "efficiency" (MONTOYE, 1982), perhaps as a result of the fact that younger, shorter individuals need to take more steps at the same speed than older, taller subjects ÅSTRAND, 1951; PATE, 1981). When Pate analyzed his data on boys and men using stepping frequency as a covariate, the difference in submaximal VO2 between men and boys persisted. However, using only body weight as the covariate, the statistically significant difference disappeared, suggesting that the difference between men and boys may be accounted for by variation in body weight. This would also explain the results reported here, i.e., lower O2 cost per kg of body weight in the heavier (older or nutritionally more adequate) boys. If the equation of GIVONI and GOLDMAN (1971) is used to calculate the energy expenditure for a 70-kg and a 50-kg man carrying 20- and 30-kg weights (Figure 9), the smaller individual expends more per kg of body weight than the larger. When the data from Figure 8 are expressed in terms of mL VO2 per kg body weight the results shown in Figure 13 are obtained. The average body weights of the seven groups of subjects are shown across the top. It is evident that there is a progressive and statistically significant (p<0.001) rise in VO2 per kg of body weight in the smaller individuals walking alone or carrying a weight, i.e., an apparent decrease in economy with decreasing body size. Similar results will be obtained when derived equations (MCDONALD, 1961) are applied to adults of different body weight. The reason is that none of the linear equations which have been derived relating energy expenditure (or VO2) to body weight while walking alone (MCDONALD, 1961) or carrying a weight (SPURR and REINA, 1986; MAHADEVA, PASSMORE and WOOLF, 1953) have a zero intercept. Consequently, whenever these equations are used to predict energy costs of locomotion or load-carrying and ex pressed in terms of body weight, the smaller individuals will appear to be "uneconomical". This is borne out in direct measurements (Figure 13). Because of the arrangement of the Givoni-Goldman equation (#5, above), when the load is zero the weight will cancel out, and individuals of different body weights will have the same apparent economy while walking. Figure 12. Submaximal VO2 at 3.5 mph treadmill speed and 15% grade as functions of average group ages. The normal groups were selected as having weight-for-age and weight-for-height >95% of Colombian norms (1969). The low weight-age group had weight-for-age <95% but weight-for-height >95% (stunted), and the low weight-height group <95% of both weight-for-age and weight-for-height (wasted) of these norms (SPURR et al., 1984). Figure 13. Data from Figure 8 expressed as VO2 in mL/min/kg body weight. Perhaps the most often mentioned result of chronic energy deficiency, after small body size and reduced BMR, is decreased physical activity. As a way of adapting to low energy intake, this is quite logical, but the objective evidence to describe its occurrence in real life is scanty. This topic has been treated elsewhere (PARÍZKOVÁ 1983) and it is not intended to review it here. But the lack of available information makes studies of the patterns of energy expenditure in populations at nutritional risk imperative. The data presented in Table 3 and Figure 7 demonstrate that larger individuals have higher values for VO2 max (L/min). But when expressed per kg of body weight of LBM (Figures 7E and F), larger individuals may have similar (U.S. vs Colombian groups C and M) or lower values (men vs boys) than smaller ones. The lower values for aerobic power of men compared to boys does not mean that the latter are capable of more work than the former. Rather, the higher values of VO2 max (L/min) indicate greater work capacity since they result from greater muscle mass performing maximally. The values of VO2 max per kg of mass (weight or LBM) are not indicators of quantity of work the individuals can perform, as has been suggested (MARGEN, 1984; FERRO-LUZZI, 1985; WATERLOW, 1986), but rather of O2 consumption per kg of tissue at maximum effort, i.e., the physical condition of the subject. One can draw no conclusions from such data about work efficiency, as has been suggested (MARGEN, 1984). What do all of the measurements described above mean in real life? Will increased dietary intake increase "productivity" in populations at marginal or greater nutritional risk? Also, is there an economic advantage to the individual or his society in attempting to increase his productivity by increasing his energy intake? The old adage that "an army marches on its stomach", attributed to Napoleon, indicates an early awareness of the relationship between nutrition and productivity, in this case the performance of soldiers. Continued interest in predicting decrements in military performance due to inadequate nutrition is evidenced by a recent workshop on the topic (Committee on Military Nutrition, 1986). In World War II, KRAUT and MULLER (1946) studied the influence of caloric supplementation on the work output of laborers in German industries during periods of food scarcity. The productivity of one group, measured as tons of material moved per hour, increased 47% when caloric intake was increased 480 kcal/d. A group of coal miners increased their productivity from 7 to 9.6 tons/d when 400 kcal were added to their diet each day. Also, WOLGEMUTH et al. (1982) found a statistically significant increase in productivity of Kenyan road workers associated with a dietary supplementation. SATYANARAYANA et al. (1980) have provided some interesting data on earning and employment of rural boys near Hyderabad, India. In these teen-age subjects, they found a statistically significant correlation between body size (weight) and wages earned in agricultural jobs. The correlation continued to be significant after partialing out the influence of age and height. Also, there was a greater percentage of high earners classified as nutritionally normal at age 5 years than those who had moderate to severe growth retardation at age 5. The reverse was true for those earning low wages. These data support the contention that body size is important in hard physical work such as farming because of its relationship to VO2 max (Table 3) and that early growth retardation can affect adult productivity and earning. The economic implications of the relationships between productivity, nutritional status and VO2 max are beyond the scope of this paper. Certainly there has been no lack of discussion about the relationships among nutrition, disease, productivity, wages and development in Third World countries (MARTORELL, 1985; BERG, 1973; OSHIMA, 1967; BALDWIN and WEISBROD, 1974; BASTA, 1977; POPKIN, 1978; BLISS and STERN, 1978; IMMINK et al., 1981; 1982; 1984). Perhaps the most interesting of the studies which relate nutritional status to economic impact are those which have been carried out by Immink and co-workers in Guatemalan agricultural workers (IMMINK et al., 1981; 1982; 1984). These authors also found a significant correlation between adult stature and productivity in sugar-cane cutters and concluded that "those workers who suffered most severely from deficient energy-protein intake during childhood and adolescence can expect their productivity in sugar-cane cutting to be relatively affected" (IMMINK et al., 1984 p. 370). These effects result in a differential in estimated lifetime total gross earnings of 16% with the shorter workers earning less (IMMINK et al., 1984). With energy supplementation, workers appeared to increase their total energy expenditure, but since there was no demonstrable effect on worker productivity, the additional energy expenditure may have occurred in non-work activities. Furthermore, lean body mass of the workers was related to productivity of sugar-cane cutters and weeders and of coffee pickers; low values for LBM were associated with reduced lifetime earnings which represent an economic cost and a reduced human capital formation (IMMINK et al., 1984). Studies in nutritionally normal and malnourished men have shown that the physical work capacity, as measured by the VO2 max. is dependent on nutritional status, such that relative to the degree of malnutrition, undernourished subjects have depressed work capacities due largely to decreased muscle mass. Since productivity in hard physical work is also directly related to physical work capacity, by implication the productivity of undernourished individuals would also be depressed in heavy physical work. During the growth of school children, even marginal malnutrition results in growth retardation, slowing of sexual maturation, delay of the growth spurt and reduction in physical work capacity (VO2 max) due to the smaller body size. There are data which suggest that in adulthood these smaller boys will be unable to produce as well in heavy physical work as their nutritionally normal counterparts and will earn less. Studies of load-carrying in men and boys indicate that only the body size (weight) and weight of the load carried influence the energy expended independently of nutritional status. While bigger men have more lean body mass and higher values for maximum physical work capacity, they also expend more energy on body movement during work but at lower relative effort (% VO2 max) than smaller, nutritionally normal or undernourished men. The limits of effort which can be sustained for an 8-hour work day are about 35-40% VO2 max. However, upper limits of daily work and, consequently, of effects on productivity may have been estimated from too few data on restricted populations. There is little information on sustained work efforts (% VO2 max) in undernourished subjects. Furthermore, a question arises about whether energy expenditure measurements are appropriate indicators for fatigue and productivity. There is some indication that strain and fatigue of back muscles can occur in long-term work, even when metabolic rates are below so-called acceptable levels. In any event, more detailed studies are needed of relative efforts sustainable for long periods in individuals of small stature, as well as those with poor nutritional intakes. Anecdotal information abounds of small men, perhaps poorly nourished, who seem to perform superhuman work tasks. However, data are scarce. It would be important to carry out these suggested studies precisely in populations where these individuals seem to flourish. Small children may have higher VO2 max values per kg of body weight or LBM than adults, while their total VO2 max (L/min) is related to their body size and, therefore, is very much lower than in adults. Consequently, the proper expression of the aerobic capacity of individuals, children or adults, is in terms of total VO2 max (L/min) when discussing their ability to perform physical work. Finally, the efficiency or economy of work in malnourished individuals needs to be studied in detail. Presently available data do not permit a definitive answer to the question of whether there is an improved efficiency of work as part of an adaptation to chronic energy deficiency. Various aspects of the work described from our laboratory have been supported by USAID Contracts AID/CSD2943 and AID/TA-C 1424, NIH Grant HD10814, Nestlé Nutrition Research Grant Programme, United Nations University, Zablocki VA Medical Center, the Fundación pare la Educación Superior, and the Universidad del Valle, Cali, Colombia.